Land area: 67.691 sq. kms. Wyoming County, Covington features the Oatka Creek's emergence from a tightly defined valley to a broad plain bordered by gentle uplands. The town's picturesque rolling hills fall off toward the Genesee Valley to the east and the Oatka Valley to the west. This naturally attractive area was named for General Leonard Covington and was permanently settled in 1806. 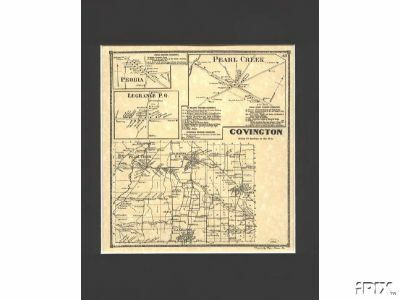 Covington officially created as a town on January 31, 1817 from the Towns of Perry and Leroy (Genesee County). However, part of the town formed in 1817 was annexed to the Town of York (Livingston County) in 1823. Covington was another of Wyoming County's "early bloomers," achieving a peak population within one generation of settlement and declining to a low of only twenty-percent of its early high by the Depression a century later. Boyds Corner - A location in the northeast Town corner. Covington Center - A hamlet located at Route 246 and Court Rd. LaGrange - A hamlet on Route 246 on the south Town line. Orrs Corners - A location near the northeast corner of the Town. Pearl Creek - A hamlet near the north Town line on Route 19. Peoria - A hamlet on Route 63 near the eastern Town line. Quinlans Corners - A location in the northeast Town corner. Spragues Corners - A hamlet between Covington and Pearl Creek. 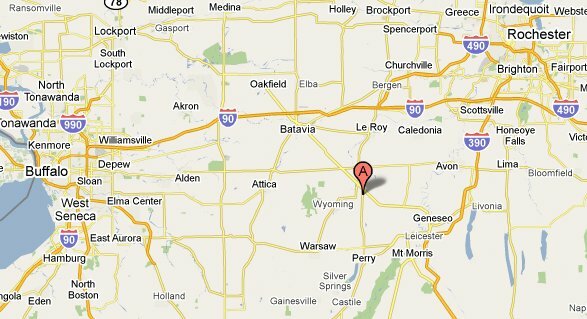 Wyoming Valley - A valley on the western edge of the Town, containing Oatka Creek. Over the years, theses hamlets have lost their identities. The Town of Covington today is a blended community without the distinction of hamlets. This elaborately executed Italianate home is among the county's best examples. The interior and exterior have changed little since initial construction. The barns associated with the property display the simple gable favored in earlier barns, and the gambrel roof popular later in the nineteenth century. Today, the Town is comprised of a total of 16,224.78 acres, or 26.13 square miles, with the Oatka Creek flowing through the Wyoming Valley in the Town. The Town is mainly a residential and agricultural community with a strong rural character anchored by the agricultural businesses located throughout the Town. Some commercial and industrial activity has increased along the Route 63 corridor which is an appropriate location due to the traffic on this major route. Since the passage of NAFTA,tractor-trailers moving goods between Canada and New York City and points south has dramatically and significantly increased traffic on this route. The New York State Department of transportation began a study in 2001 investigating increased truck traffic within the Route 63 corridor through Genesee, Livingston and Wyoming counties. The study focuses on travel in the vicinity of Route 63 between the I-90 New York Thruway Exit 48A in Pembroke and I-390 Exit 7 in Mount Morris, Livingston County. Revitalization efforts should take advantage of opportunities presented by having three major routes traversing the Town of Covington, Route 19, Route 246 and Route 63. 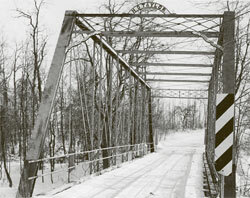 Thrusting its 124-foot span across the Oatka Creek, this Pratt truss bridge cost $1650 when new. Despite its quaint appearance now, it was a large factory-made prefabricated piece of new engineering. The Town would like to concentrate commercial and industrial economic development efforts in the vicinity of the Route 63 corridor due to the traffic on this major route. Small commercial growth would be appropriate in the area of Route 19, while residential development should be directed along the Route 246 corridor where there is potential of municipal water. Any development in these areas should be guided in the manner that will improved upon the established community character with the continued support of agricultural uses. From its earliest beginnings as a simple Federal structure, the house was periodically added to and improved. 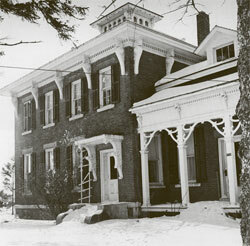 In 1914, the noted Rochester architect Claude Bragdon was engaged to design plans for the remodeling in keeping with its original simple design. Much of the furniture was designed and built by traveling craftsmen, and the original bell used to call the farmhands to meals is still in place. Five generations of the Brooks family resided here and figured prominently in the development of the Covington and surrounding areas. Benedict Brooks, the pioneer settler, was a founder of the Middlebury Academy, served as a judge, and in 1821 served as a state legislator. His son, Hugh, helped many immigrants to settle in this area during the potato famine in Ireland in the 1840's by finding residences and work for them. As an avid abolitionist, his home became an Underground Railroad station known as the "Covington Route." Land area: 95.196 sq. kms. A small village in Franklin County, on Salmon River, 72 miles North West by West of Burlington, Vermont. Close to Canadian border. Near St Lawrence Seaway, North of Westville Center, East of Hogansburg and the Saint Regis Indian Reservation. Named after Brigadier General Leonard Covington (1788-1813), a Marylander killed at the Battle of Chrystler's Field, Upper Canada, on November 11, 1813, this substantial brick and earth fortification was designed in a wedge-shape with walls 10' high and 185' long. The fort had a powder house, barracks, guardhouse, and a platform mounting ten 18-pdr. naval guns. Begun in 1813 and completed in the Spring of 1814, this battery was normally manned by the U.S. Sea Fencibles. During the battle, it was commanded by Lt. Henry Newcomb, whose 80 seamen from the USS Guerriere successfully repulsed a flanking maneuver by British longboats. Dismantled in 1832, the fort's bricks were used in Fort McHenry's seawall. No marker identifies the site today; however, the new Baltimore Sun plant occupies the general area of the fort. Fort Covington can be seen in the far right of A. J. Miller's panorama painting in the Visitor Center. "Fort Covington Namesake Died Leading Troops"
FORT COVINGTON - A British sharpshooter leveled his weapon and shortened the life of Brigadier General Leonard Covington 176 years ago. "He fell where he always fought, at the head of his men, and survived but two days," according to a serialization of a work by historian Leonard Jamison. General Covington was killed while on horseback leading his brigade in what has come to be known as the Battle of Chrysler's Field, which was fought in nearby Upper Canada Village on Nov. 11,1813. 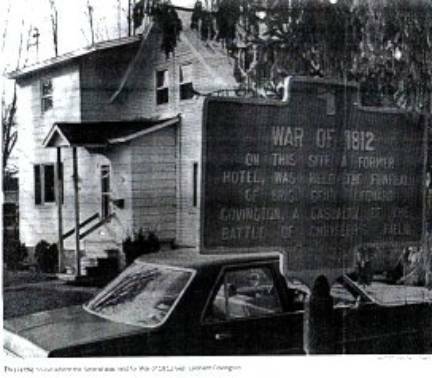 The anniversary of that battle this year coincided with Veterans Day. Fort Covington, previously named French Mills, was named after the general who was brought to the shores of the Franklin County town where he died. But the body of General Covington was taken to Sackets Harbor in Jefferson County, along with the bodies of his aides who had also fallen during combat, on a barge in 1821. Historian Robert J. Brennan who says he has the most complete records of military cemeteries in Sackets Harbor, had said it is uncertain whether the grave of the Maryland-born general will ever be located. But he had been trying to interest a newspaper in Covington, Kentucky, in starting a drive to place a marker at Sackets Harbor commemorating the General and his courageous leadership. Despite this project, the acts of General Covington have been revived somewhat by the placement of historical markers around Fort Covington in recent years. Through the fall of 1813, the American Army was battling the British and their fleet, a Canadian militia and various Indian bands. General Coviington participated in several of these conflicts that raged on both present-day U.S. soil as well as on the Canadian side of the St. Lawrence River. On Nov.10, 11 days after the general's 45th birthday, a contingent of soldiers and an accompanying flotilla moved down the river near Upper Canada Village. That night, the soldiers were forced to lie on their weapons to keep them dry from a heavy rain. Voicing apprehension about the ferocity of the engagements up to that point, the soldiers forced General Covington to address them regarding their duties. "We have no choice but to onward because without independence and liberty, there would be no choice," the general is supposed to have said. Whether these words had a calming effect on the soldiers, the brigade was up in the morning and continued to march along the St. Lawrence River toward Chrysler's Field. The British also advanced as the opposing sides reached the field. General Covington was not required to participate in the battle, but did so to aid the American approach. As he rode with his men into the fight, General Covington moved toward the British artillery. After pushing them back from the left side of the attack, he attracted the attention of a group of sharpshooters who were holed up in a house on the field. "At this critical moment, while bravely leading his men, he was shot through the body. His fall disconcerted the brigade and a shower of grape shot at that moment scourged it severely," one account of the battle reads. From the battlefield, the General was brought across the river and up the Big Salmon River to a house in French Mills Three days later, he died and was buried, only to be later taken to Sackets Harbor where the regiment was stationed. Until 2001, the location of the general's grave, as well as that of Gen. Zebulon Montgomery Pike, who were the only generals to die during the War of 1812, was not known, but it has now been found, but not yet marked at Mount Covington cemetery at Sackets Harbor, NY. Info sent by Gary O'Dell of Sackets Harbor, 2006 states "Efforts to have markers for these 1812 ers are in process. The condition of his burial site is a National disgrace."